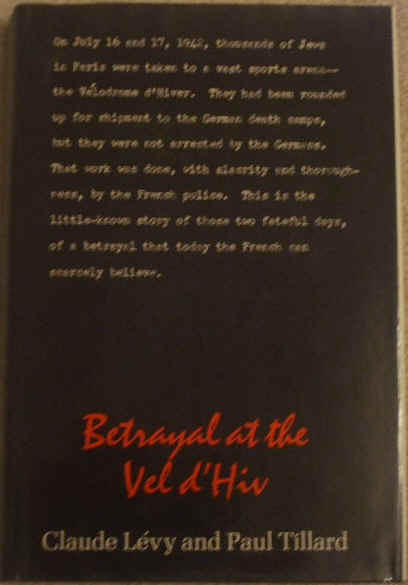 A scarce first USA edition, first print hardback of BETRAYAL AT THE VEL D'HIV by Claude Levy and Paul Tillard. Preface by Joseph Kessel of the Academie Francaise. Translated by Inea Bushnaq and published by Hill and Wang, New York in 1969. Stated 'First American Edition: July 1969' on the copyright page. The book is in very good condition (Clean black cloth boards and pink lettering on spine which has minor rubbing to the spine edges) with only minor wear to the dust jacket, which is not price clipped (light rubbing to the edges, very slight tanning inside the jacket). Internally, the pages are clean and tight, there are no tears and no inscriptions. There is some tape removal residue on the endpapers. "It began on July 16, 1942. The plot was part of "Operation Spring Wind." The result was the roundup, in one day, of 12,884 Jews living in France at the time of the German Occupation. Seized without warning, men, women, children, and old people, invalids too, were piled into buses and taken to a Paris sports arena, the Ve'lodrone D'Hiver, on the first stage of a journey toward death at Auschwitz. The story of this roundup of non-French Jews is told in Betrayal at the Vel d'Hiv with the ruthless economy of a documentary; the manhunt, the crowding of thousands of victims into the glassed cage of the arena, transportation of convoy after convoy from the Vel d'Hiv to Drancy and eventually to the "final solution". Wherever possible, the authors have quoted eyewitness accounts and transcribed documents. The contrast between the businesslike, clerical itemization of who is to be considered eligible for arrest and the moving personal stories creates a chilling picture of humanity overwhelmed by the bureaucracy of murder. Although there were Frenchmen who cared about and helped the hunted, the book in the main insists that we face terrible truths; the French police carried out the orders of the Germans with efficiency and without mercy. Many French citizens saw their neighbours taken away without batting an eye. The details build up convincingly until we come full circle and say, "No, it couldn't have happened." We know it happened. We feel it could not have. No one will read this book without reacting to it both with disbelief and with the horror that comes from believing." 284 pages. Illustrated with 16 pages of black & white photographs.